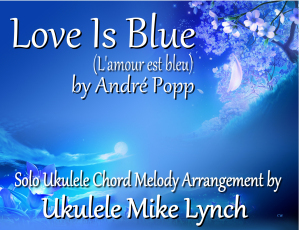 “L’amour est bleu” (English title: “Love Is Blue”) is a song whose music was composed by André Popp, and whose lyrics were written by Pierre Cour, in 1967. Brian Blackburn later wrote English-language lyrics for it. First performed in French by Greek singer Vicky Leandros (appearing as Vicky) as the Luxembourgian entry in the Eurovision Song Contest 1967, it has since been recorded by many other musicians, most notably French orchestra leader Paul Mauriat, whose familiar instrumental version became the only number-one hit by a French artist to top the Billboard Hot 100 in America.